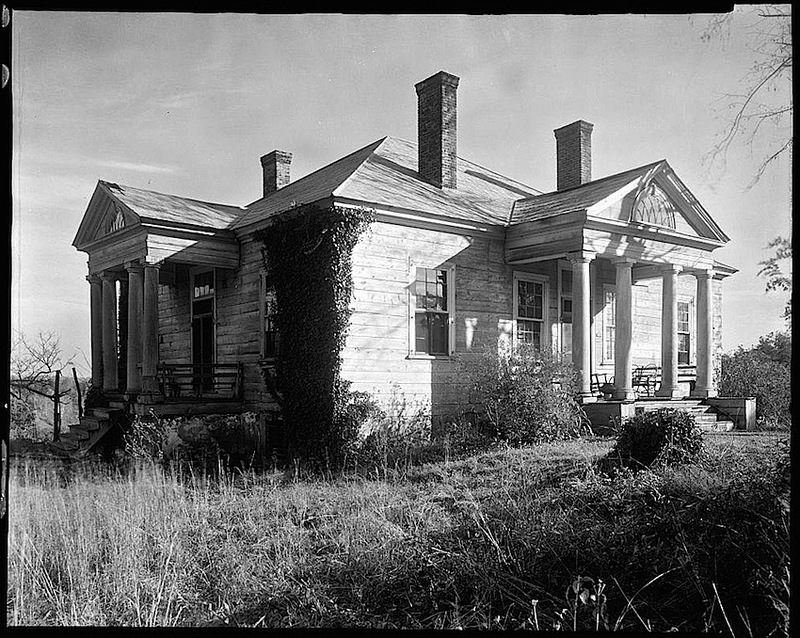 Edgemont (or Cocke Farm), Albemarle County, Virginia, 1935, by Frances Benjamin Johnston, via Library of Congress Prints and Photographs Division. Built ca. 1796 for James Powell Cocke, Edgemont is significant as a very early example of a country residence in the combination Palladian and French manner promulgated by Thomas Jefferson. Although the design of the house has been credited to Jefferson for several decades, precise documentation of the authorship remains yet to be established. The character* of the compact and sophisticated dwelling is uniquely Jeffersonian, however, and exhibits the influence he had on the architecture of his region. . . .
At the time of the photo, only two porticoes of the probable original four still existed. The house was restored and renovated in the late 1930s and 1940s. There are more F.B.J. photos here and 1996 photos here. Now that is a dream house; at least from this view if not as much from the back side. The cornices in the interior shot are stunning. I was amused at the AD photo where the entrance gate looks more important than the house.